NEW BRITAIN - His dad and uncle built the garage in 1948. It featured a bait and tackle shop, but now Robert Story, the owner of Story Brothers, at 84 Burritt St., offers much more. “I wanted to fix cars instead of date women,” said Story on why he got involved with the shop. The mechanical and auto body shop offers services that rival any car dealership with just as many garage bays and the same factory scanning equipment to work on anything from diesel trucks to a Honda Civic. “There’s nothing that we won’t take in,” said David Japonis, who heads the mechanic division. That means brake work to transmission repair with their in-house transmission rebuilder. The fully certified Automotive Service Excellence (ASE) technicians work with factory tools for the makes of Ford, Dodge, Honda, Nissan, Volkswagen, and the newest versions of General Motors. “We don’t have just run-of-the-mill average Joes here, we’ve got guys that have some brains, which means a lot today,” said Japonis. On the body work side, the shop also has laser measuring equipment for all their work, along with two paint booths, in-house mixing to make any color desired, and welders for steel and aluminum vehicles. “Bob’s not afraid to spend the money on the technology,” said Japonis on the quality of tools used to repair a customer’s car. 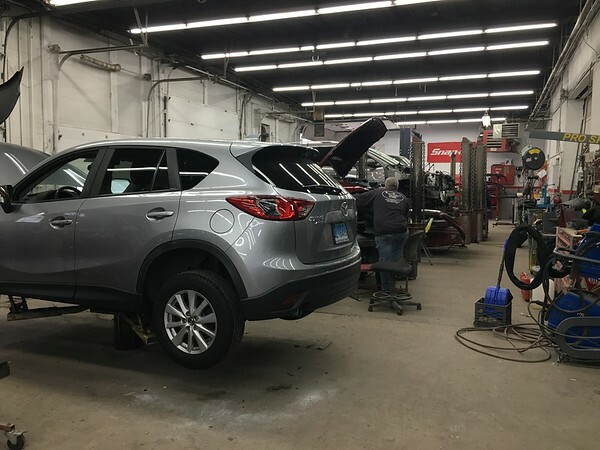 That, along with their ability to take on any work, while other shops may cherry pick what to work on, is what sets Story Brothers apart from other auto repair shops, Japonis added. “Our pricing is very reasonable,” said Jeff Sachs, who heads the body work division. The body shop, which works on major collision and restoration repairs, is considered a direct repair facility for most major insurance companies. Every car that comes out of the body shop gets detailed, Sachs said. “We stand behind our repairs too,” said Japonis, with warranties on mechanical work that lasts for 24,000 miles and two years. There’s a lifetime warranty on the body work. In addition to a 24-hour towing service, the shop works directly with Enterprise to arrange car rentals during repairs and helps with used car purchases. “They give us a budget and all the things they want in a vehicle, and we do all the work for them,” said Manny Story, who heads the used car sale division. Manny Story and his team will determine a price of the vehicle and be on the lookout for the car of a customer’s desires. There are also a number of used car options on site, which can be found via an inventory online. “Try to keep people happy, keep the trust,” said Japonis on what the shop plans to do going forward. Story Brothers is open from 8 a.m. to 5 p.m. Monday through Friday, and 8 a.m. to 1 p.m. on Saturdays. They can be found online at storybrothersauto.com or by phone at 860-225-0159. Posted in New Britain Herald, , Business, on Tuesday, 26 December 2017 20:49. Updated: Tuesday, 26 December 2017 20:52.